Drills are used to create the initial ostetomy for the plant to be driven into the bone. 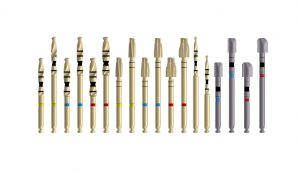 The Implanova® Surgical kit includes four types of drills: lance drills, core drills, head drills and short drills. 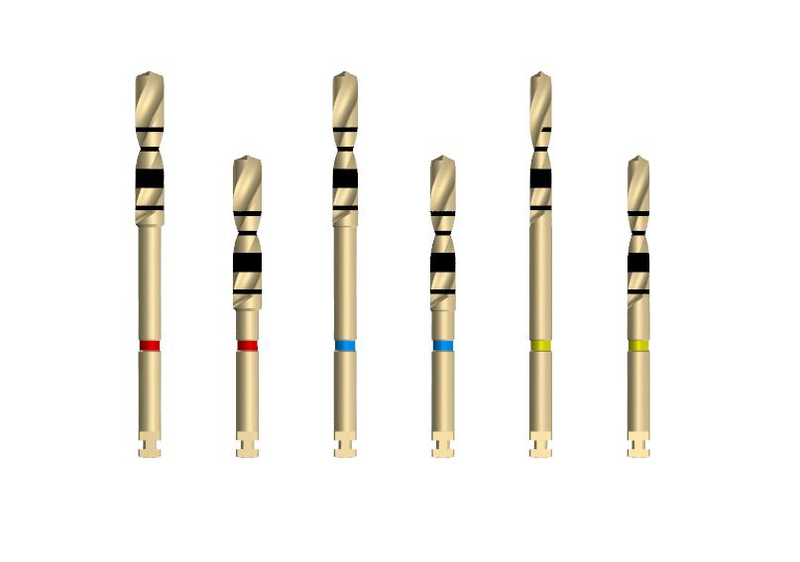 The depth marking on all the cylindrical drills are identical and are marked at 6, 8,10,12 and 14 millimeter. All drills come in shore and long shank lengths. There is also a drill extender that can further extend the length of the drill when needed. Implanova® Lance drill is a triangular cross cut sharp dril used to create the initial freehand osteotomy. Core drills are cylindrical twist drills that are used to create the osteotomy to the predetermined depth of intended placement. 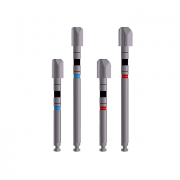 The colorless thin core drill can be used as a pilot drill for the narrow, medium and wide implants or as the final core drill of the slim implant. Core drills are color coordinated. Colorless is the pilot drill. Yellow color is for narrow implants. Blue color is for standard implants. And red color is for wide implants. 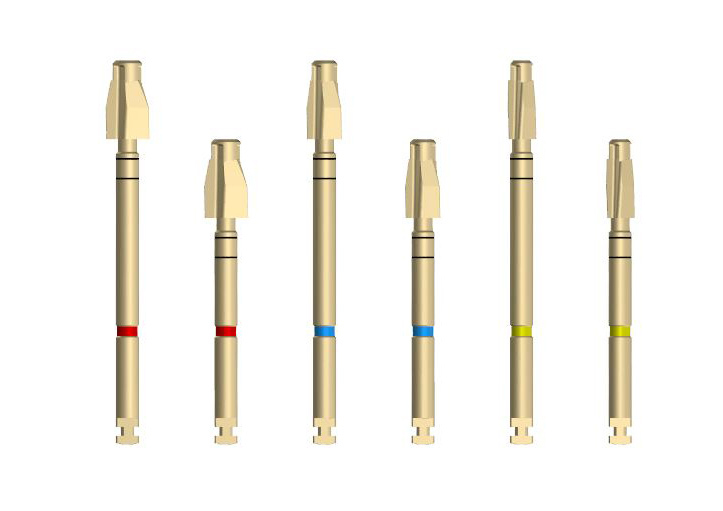 The core drills are to be used for initial osteotomy and should be drilled to the desired length of the implant for crestal placement, length+1mm for subcrestal placement and length+2mm for way subcrestal placement. Head drills are optional counter-sink drills that can aid the osteotomy by the implants for the harder cortical bone. Except in posterior maxillary area, head drills are recommended to facilitate the placement of Implanova® implants. Entire length of the head drills are 8 mm, and they can be inserted to length for 8, 10, 12, and 14 millimeter implants. The first laser marking above the blades mark the depth of subcrestal placement and the second laser marking marks the depth of way-subcresal placement. Yellow color is for narrow implants. Blue color is for standard implants. And red color is for wide implants. Short drills are specifically designed to aid in the placement of 6 mm and 8 mm long implants. The entire length of the short drills are 6mm and their taper and diameter is ideal to be used for the shape of extra short and short 4.5 mm and 5.5 mm. 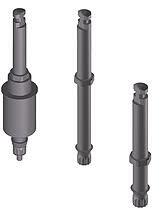 The overall diameter of the short drills are slightly wider than the head drills. Short drills are color coded blue color for standard implants and red color for wide implants. The laser markings on the short drills are identical to the core drills and are marked by 6mm in the bracket to the blade, 8mm, 10 mm and 14 mm. All drills must be used with copious external irrigation at 800 to 1200 RPM with 500 to 1000 grams of pressure, in a pumping motion to allow sufficient cooling. It is imperative that drills be renewed often as using dull drills are number one cause of excessive heat and implant failure. Parallel/depth guides are used to determine the depth and orientation of osteotomy that has been drilled. One end of the guide is to be used to gauge core drill osteotomy, while the other end is to be used for the head drill osteotomy. Parallel guides are laser-marked and color-coded to the same specification as the drills. The material constituent of the parallel guides is 17-4 Stainless Steel. Implanova SecureClick™ Implant Drivers are used for placement and torquing of implant fixtures and prevents implants from falling off the instrument into the mouth of the patient, which is a common problem with other implant systems. SecureClick™ implant driver is designed with a double hex head the fits perfectly inside the implant mouth and allows for tight engagement and retention with implant fixture. A small metal O-ring sits at the top of the implant driver and expands when inside the implant fixture, creating clicking sound that indicates added retention, preventing possibility of the implant fixture falling off. To remove the driver from the paced implant, all the clinician needs to d is simply wiggle it off, which can be achieved by virtue of a curved neck on the driver. There is also an external hexagon on the shaft of the driver which allows for high placement torque of up to 80 N-cm when used with the Implanova® ratchet adapter and compatible hand pieces. Implanova® SecureClick™ implant drivers are manufactured with high-strength stainless steel, and is heat-treated for additional hardness and strength. One implant driver can be used for all implant sizes, and are available in short and long versions. The guided implant driver can be used in the same ring that was used to perform the osteotomy to place the implant precisely in its intended depth, direction and position. 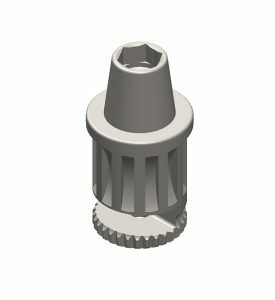 Pick’Em Up™ hex drivers are used for placement and torquing of restorative components, such as healing caps, abutments and screws. Pick’Em Up ™ hex drivers have tapered hexagonal head that will engage tightly with the universal internal hexagon in the restorative component that is being placed. Pick’Em Up™ hex drivers can be used to drive restorative components to 25 N-Cm and will fit in all restorative components. They come in short, medium, and long iterations. The material constituent of the Pick’Em Up™ hex drivers is Customs 455 Stainless Steel. The Implanova® Ratchet Adapter also features an internal hexagon sleeve that allows for higher torque application when used with the tool having a corresponding external hexagon. The Torque Ratchet and the Ratchet Adapters are both manufactured using high strength stainless steel. *A plastic instrument or any other thin flat instrument can be used to push out the locked-in latch tool from the Ratchet Adapter. Torque wrench and ratchet adapters are used for manual torquing and placement of any component in the Implanova® system. The torque ratchet allows for up to 70 N-Cm of torque. The torque ratchet can be used in conjunction with the ratchet adapter, which allows for an ISO latch type tool to be used with a torque wrench. The ratchet adapter features an internal hexagonal sleeve that allows for higher torque application when used with a corresponding tool for implant placement. The material constituent of the torque ratchets and ratchet adapters is 420 Stainless Steel.